It easy to forget that there is actually two great performances at the centre of Rain Man. Understandably, Dustin Hoffman took the plaudits, gaining himself an Oscar win for the role of Raymond. His performance is worthy of the award too. Dustin Hoffman has never been better than he is here, giving a career best performance as a man suffering from autism. It isn’t just in the major scenes and moments either. Of course the screams, the constant babbling and the misunderstanding of the world around him are what helps you understand the illness Hoffman’s character is suffering from. Scenes in which he waits for a date that will never come, uncomfortably kissing Valeria Golino’s Susanna or the screaming and panic when he accidentally sets the fire alarm off are all the moments which people remember. It is the more subtle moments which are effective too though. When Hoffman is the background to a scene but effectively portraying autism, often in just the motion of his head, the confused look on his face or the way he holds his bag, or his whole body, awkwardly. It is what Oscar winning performances are made of and unfortunately overshadows the other great performance in the movie. Tom Cruise doesn’t have the heavy-lifting, acting masterclass that Hoffman is expected to deliver but that doesn’t make his role any less worthy. Cruise is left with the unfortunate position of being the window we see the events through. His frustration at Raymond, his attempts to make him understand or get close to his brother are all moments that only work if we are invested in Cruise’s character too and considering he is obnoxious, selfish and cruel to begin the movie, this is no small task. Of course, the movie is about the two brothers repairing their lost relationship and this means Cruise’s character is expected to make a transformation that is believable without being too extreme. This is done subtly as well, with attempts to hug his autistic brother (which ends badly), realisations of their shared past or the most effective scene of all, the meeting which will determine Raymond’s fate and Cruise’s realisation of the truth of the situation. These two performances are what make Rain Man so effective and memorable. It is through these performances that the other key ingredients that make the film effective work so well. The toothpicks, the casino and card counting and the dancing in both the hotel room and elevator are all effective and memorable because Cruise and mostly Hoffman sell them so convincingly. 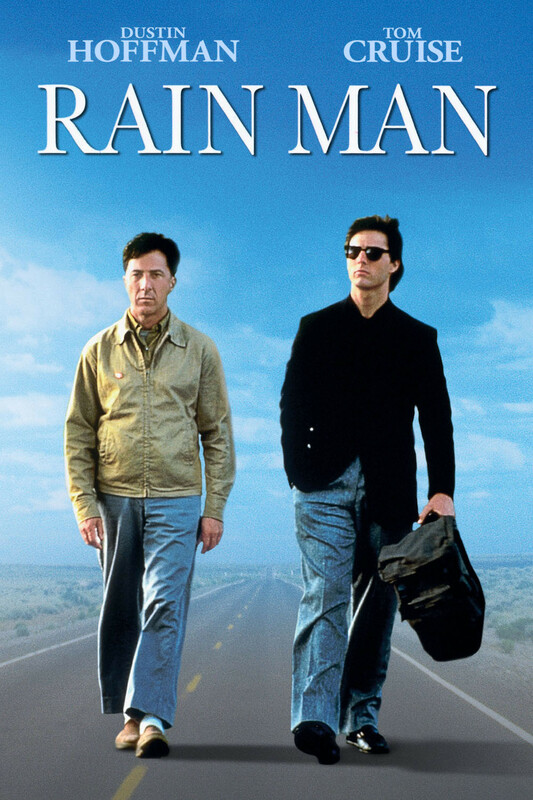 Overall, Rain Man is a showcase for two great actor’s talents. Dustin Hoffman gives the best performance of his career and transforms into the autistic titular character while Tom Cruise shows an acting pedigree he hasn’t demonstrated for a long time. It is easy to overlook the latter but only when both are at the top of their games does the film really work.